This painting is not unusual in Monet's oeuvre: the high line of the horizon, the off-centre framing of the subject, the osmosis between sea and sky, all these elements are within the style of this master. Monet painted this work in a region he had known well since his youth and in a location where he met a number of friends who influenced him in his early years: Boudin, Jongkind, Courbet. He briefly sojourned in Trouville at the end of the month of August of 1881, at a time when his complicated sentimental life and his financial worries made him want to keep away from Alice Hoschedé. Evidence of his stay on the Norman coast is a letter to Durand-Ruel dated on 13 September, in which the artist told him he had had to shorten his stay due to the bad weather and come back empty-handed, without being able to bring home any works. However, it would seem that four paintings escaped the disaster: three executed in Trouville or the nearby coast: The Hut in Trouville, Low Tide, The Coast in Trouville and Gust of Wind, and a fourth painted in Sainte-Adresse. The Hut in Trouville is not the first taste Monet offers us of this type of composition dominated by emptiness and the ephemeral. In 1867 he executed a painting, Hut in Sainte-Adresse, in which the high line of the horizon and the sea with its small sailing boats resemble those in the Trouville painting. However, the hut has a more central position in the Sainte-Adresse landscape, which is developed along a horizontal band in the foreground. In spite of this, the two works are very similar in spirit. It has been suggested that the coastline reproduced in the work of the Thyssen Collection was not that of Trouville, but that of Sainte-Adresse. However, the height of the hill on which the hut stands, the horizon marked on the left by a bend in the coastline towards Deauville and further on, and the shape of the sandy beach, seem to indicate that it is indeed the coast near Trouville coming from Honfleur. 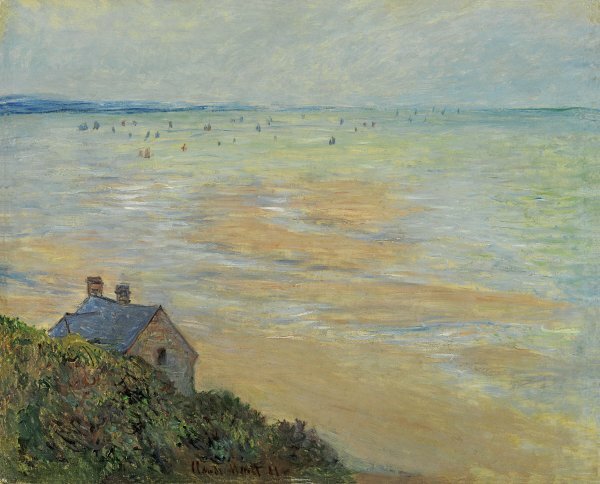 Another similarity strikes the viewer when looking at The Hut in Trouville: the very close link with The Customs Officers' Hut (or Fisherman's Hut) which Monet painted a year later, in 1882, in Varengeville, in several versions. The composition is identical: the high line of the horizon, the choice of the point of view, the cliff in the left-hand corner of the painting, the site and shape of the hut. The hut in Trouville is a good example of those paintings of the ephemeral in which the subject does not exist. The liquid harmony of the sky and the sea, separated by a thin horizon line in a darker hue, the transparency of the water lapping the blonde sand as it goes out, are the true subject of this landscape. The coast covered with bushes and the house are there only to counterbalance, with their dark and dense mass, the "magic of the air and the water" and to set it off. There again, Monet's genius interpreted the lessons of his first master Eugène Boudin, who was himself a poet of atmospheric effects, acknowledged by Baudelaire, Corot and Courbet. The desire, often expressed by Boudin, to capture the light and render the ephemeral tangible, is also found in this work by Monet. Boudin too interpreted in his art the Norman coasts which became, at the end of his life, wide spaces depicted with light and long brushstrokes which do not entirely cover the canvas. A common spirit can sometimes be perceived in their respective works. This painting may have influenced other artist friends: Gustave Caillebotte produced a similar version entitled Villas in Trouville in 1884, using the same type of composition inspired by the boldness of the landscapes found in Japanese prints.